39 people have been killed and more than 70 injured after two female suicide bombers blew themselves up on Moscow Metro trains in Monday's morning rush hour, officials say. 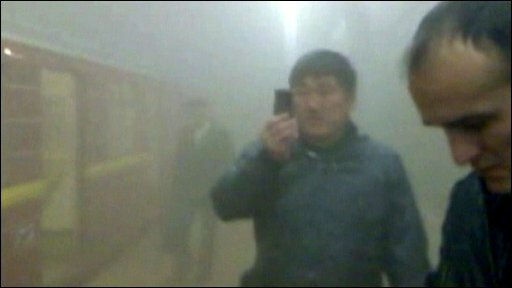 Three short sequences of amateur footage have been posted which appear to capture the scenes of confusion underground in the aftermath of the blasts. The initial two pieces of footage appear to have been filmed in Lubyanka station. The BBC cannot verify the content of this footage.